The SKA project is going to result in two very large radio telescope arrays, one in South Africa and one in Western Australia. 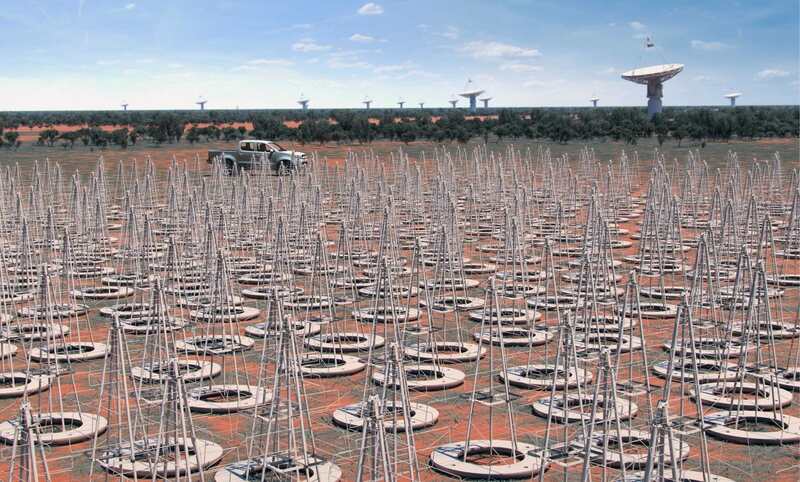 The data that these radio telescope arrays will collect will try to answer big science questions like: what are the flow-on effects from the Big Bang? How do different galaxies evolve? Can we find prebiotic molecules on other planets (a sign of extraterrestrial life forms)? And all that traffic will come down one data pipe, to one computer that will be running 24/7. This is high performance computing at it’s most elegant, taking a global scale effort and turning it into algorithms that are flexible enough to support the science over the lifetime of a project. Today the problem seems insurmountable, but once it’s done it will set the bar for what everyone expects on a day-to-day basis. “Without REANNZ, we probably wouldn’t be working on this project. It would be very difficult for us to be able to do our project work without a good network on which to prototype,” Dr Ensor said. Andrew and his team rely on REANNZ for their networking expertise. He says, “REANNZ has experience in transporting very significant amounts of data in real time, which is valuable expertise for our team. There are currently several radio telescope dishes in Warkworth which generate large quantities of data, each one typically producing five or ten gigabytes of data every second. The data collected at those telescopes travels over a 10Gb/s connection to Auckland on the REANNZ network where it is processed in real time, allowing Andrew and his team to model what will happen in the SKA project. “I think this is probably the first mega-science project New Zealand’s been so substantially involved in. We tend to think of New Zealand as a small player, that can’t really be on a world stage with other countries, but it’s not the case in this project,” Dr Ensor said. The SKA project has 11 country participants so far, with another two to four countries planning to join soon. The international teams working on the SKA project are well known for big science projects. The teams have worked on the VLA project that was seen in the movie Contact, the Large Hadron Collider and even the International Space Station, moving from big project to big project. The SKA project is so cutting-edge that the computer system which Andrew is currently trying to design won’t even start being built until 2018. Current technology can’t handle the data rates needed for the project, so AUT and REANNZ have to look forward to see where technology is heading. “It’s important to us to have high speed networks just so that we can ship this data around, plain and simple. Without that we’ll have a big data problem,” Dr Ensor said.